Understanding the quality and composition of water on farm is a critical component to modern farm-system management. Hill Laboratories offers a variety of agricultural water tests so that you can all of your on-farm needs met by a single supplier. Irrigation water is becoming increasingly important in parts of New Zealand, particularly on the east coast of the South Island where rainfall can be scarce. Because irrigation water often has significant levels of dissolved salts, it can have a detrimental effect not only on the irrigated soil, but also on the pumping equipment used. It is therefore important to test the water in order that any issues may be anticipated and the productivity of irrigated land and associated water resources maintained. Guidelines for Irrigation water quality can be found in the ANZECC guidelines. These guidelines cover a wide variety of analytes, therefore we have selected the most appropriate for the irrigation water testing. For a more complete listing of our water testing options and the associated test details, simply call us or complete the form below and we will be happy to help you decide what test is best for your particular needs. Request an Irrigation Water Kit online. It contains 2 sample containers which are all required for one test, i.e. they should all be filled from the same sampling point. If you require microbe testing please consult us. 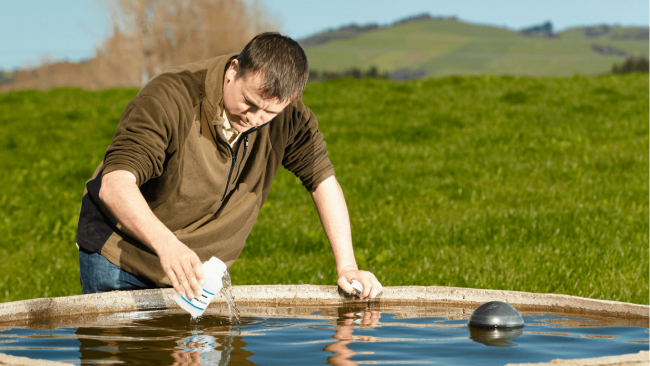 The analytes in the livestock drinking water profile and their associated trigger values have been taken from the Australian and New Zealand Guidelines for Fresh and Marine Water Quality (ANZECC), section 4.3 Livestock drinking water quality. The ANZECC guidelines cover a wide variety of chemicals, however we have only included those analytes likely to be of concern. For a more complete listing of our water testing options and the associated test details, simply call us or complete the form below and we will be happy to help you decide what test is best for your particular needs. To assist growers and farmers in meeting Global GAP requirements, Hill Laboratories offers a convenient Global GAP Test Kit. The test kit includes analysis for the presence of E. coli and Faecal Coliforms in water and includes all of the necessary sample items, as well as a discounted courier ticket. The Global GAP Test is IANZ Accredited and results are provided on a 3 day turnaround time. For a more complete listing of our water testing options and the associated test details or to request a sample collection kit, simply call us or complete the form below and we will be happy to help you decide what test is best for your particular needs. Use of dairy effluent as a source of nutrients for pasture growth has become commonplace, however frequently farmers have little insight on the nutrient composition of effluent being applied, which will change regularly depending on animal feed inputs. This can result in sub-optimal use of effluent as a resource or over application of other nutrient sources, such as fertiliser. As such, Hill Laboratories has developed a specific test, the Dairy Effluent Test, for testing effluent composition. Order a Dairy Effluent kit online. Contacting us is easy. Simply complete the form below and one of our friendly Client Services Managers will be back in contact with you shortly.